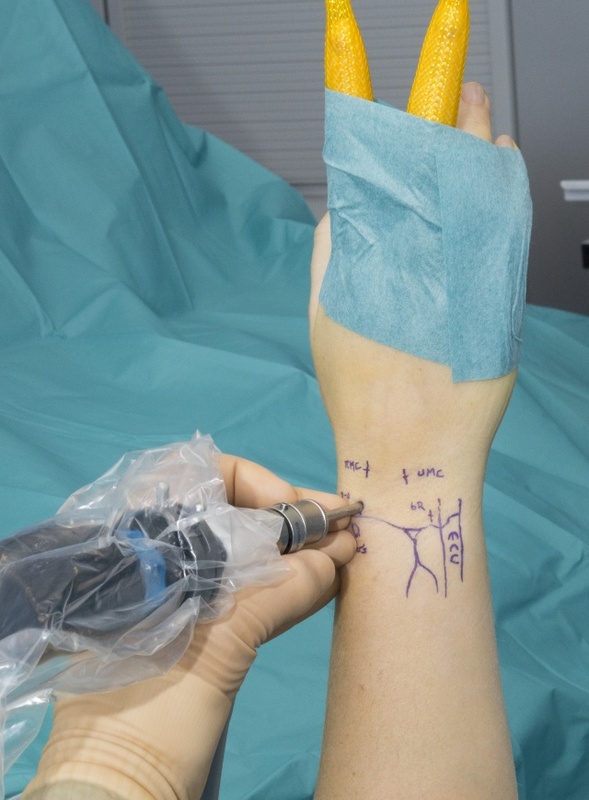 Learn the Diagnostic Wrist Arthroscopy (using Acumed ARC Tower ) surgical technique with step by step instructions on OrthOracle. Our e-learning platform contains high resolution images and a certified CME of the Diagnostic Wrist Arthroscopy (using Acumed ARC Tower ) surgical procedure. This is a detailed step by step instruction through the set up and procedure of a diagnostic wrist arthroscopy using the Acumed TM ARC Tower traction system. Wrist arthroscopy is an expanding speciality and with the improvement in diagnostics with 3T MRI scanning it is being used less for diagnostic procedures and more for definitive surgical interventions. Diagnostic wrist arthroscopy is an excellent way to become familiar with the procedure and develop skills to advance onto more invasive procedures using wrist arthroscopy. If a diagnostic arthroscopy is used to confirm a MRI or clinical finding then an further open or arthroscopic procedure can be often performed at the same sitting if the patient has been appropriately consented. Despite the improvement in MRI scanning and interpretation, wrist arthroscopy is still the gold standard for many conditions although the invasive nature and cost of the procedure certainly has some disadvantages compared with MRI. Conditions particularly difficult to determine on MRI are Luno-triquetral interosseous ligament (LTIL) injuries and injuries causing symptomatic mid-carpal instability. Bony injuries are much better seen on MRI and unlikely to be missed due to the oedema seen in the bone. Following a diagnostic wrist arthroscopy, patients are usually placed in plaster cast for 1 week for comfort then allowed to mobilise to reduced stiffness. The individual post-operative rehabilitation or further intervention will clearly depend on the arthroscopic findings and patient wishes. Complications in diagnostic wrist arthroscopy or rare and usually minor however it has been shown that when surgeons are learning this skill, tendon injuries and iatrogenic cartilage injuries are more frequent.